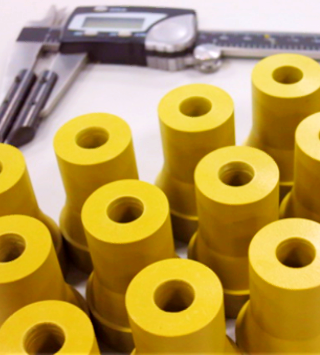 Mustang Seal Solutions specializes in plastic machining for the oil and gas industry. Mustang Seal Solutions fabricates high-quality custom plastic components tailored for your exact needs. We have state of the art CNC machines combined with our qualified personnel to machine conventional and complex plastic products for you. We reinforce our products to enhance strength and longevity. Our collaborative in-house design and build process includes quality assurance and ensures customer satisfaction. We individually tailor our process to meet custom requirements for every project. Does Mustang Seal Solutions machine plastic shapes or flat sheet stock? Along with sheets, we machine angles, tube, rod, channels, and any complex shape through which our engineers can design a suitable fixture. Does Mustang Seal Solutions provide other services besides plastic machining? Yes, we do. Depending on your requirement, we also do inserts, assembly, engravings, printing, sand blasting and annealing. Be sure to contact us at (713) 936-5787 for any enquiries. We do not typically stock custom machined plastics parts. However, some common parts commonly purchased by our customers are reviewed for stocking programs in an effort to reduce lead times. Send us a request for the part at (713) 936-5787 and we will let you know.